My wife got into running a couple years ago, building up from a strong dislike of the sport to a passion for it. Today she ran her second marathon, cutting 34 minutes off her time from her first one last year. 4:31 last year to 3:57 this year. That’s beyond incredible, and I am totally impressed with her, not just for her performance today, but for the consistency, the training, the diligence, and the perseverance. Really something to admire and aspire to. She trained for a time and was pretty much spot on (better actually), but that speaks so well to knowing herself as a runner through experience and self-initiated challenges, and what has turned out to be a level of natural gift for the sport she didn’t realize she had until starting to take it seriously. 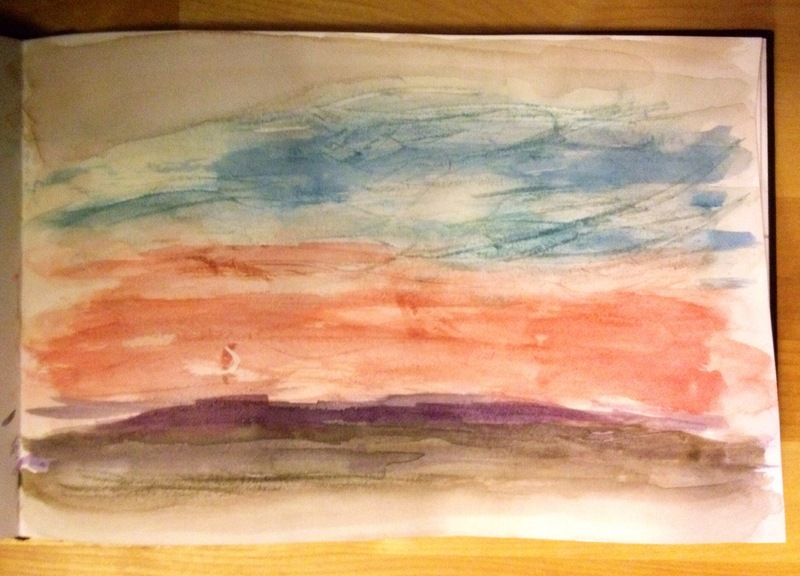 This brings me to art, and one of the watercolorists who most embodies the qualities my wife exhibited: Turner. The Tate has an incredible collection of Turner’s sketchbooks here. I have been looking at them a lot over the past few days. Some of his sketchbook works were far more than sketches. they were very developed works of art, though small. Others are quick dashes–studies of light at different times of day, or studies of the sky under different weather conditions. 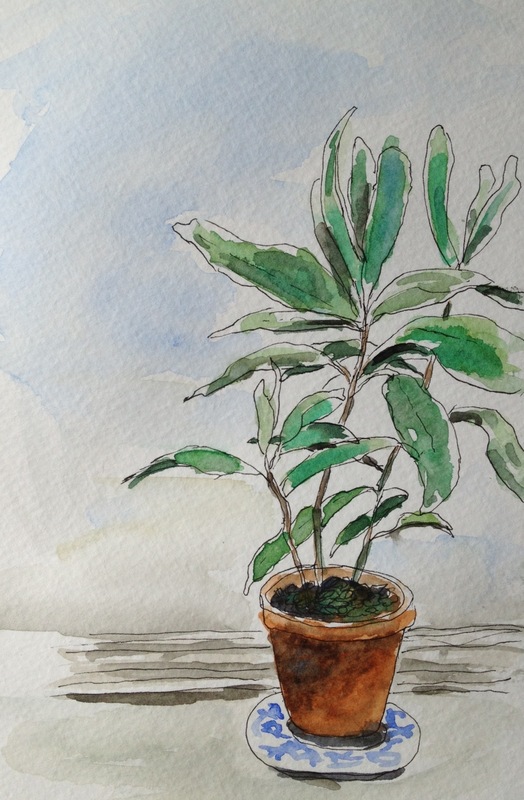 These studies were especially interesting to me, as I want to used sketching more as experiment than attempt to get a scene, as self-initiated challenges and training as my wife did with her running–as an aside, she is also an artist and inspired me to pick up the brush in the first place. Turner was very rough and loose with his studies, but he obviously had masterful understanding of light and weather. In an attempt to try to understand how I might sketch like he did, how I might study, I did this quick study of one of his studies. I tried to paint quickly, and get some pretty saturated washes on, then scrape with my fingernails to add texture and energy. Lots more space to experiment in this line. Here it is. 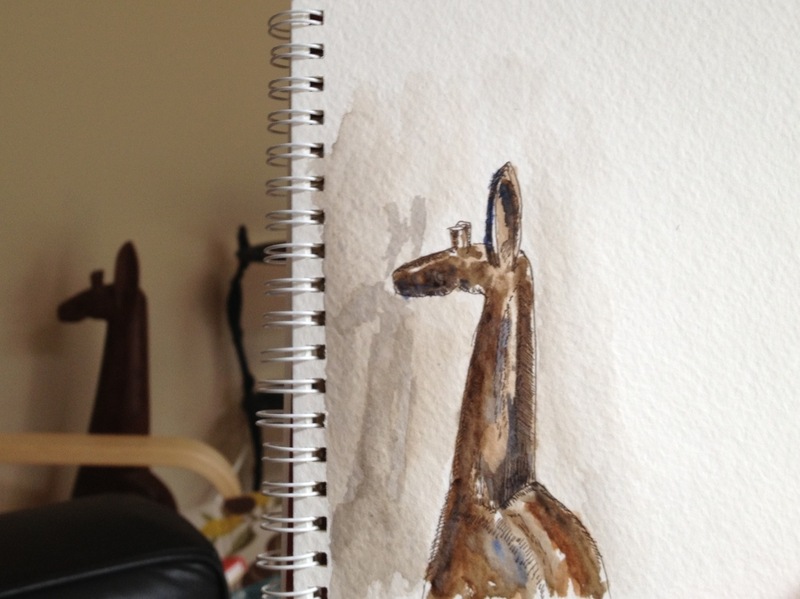 In addition, I am trying to work out a minimal set of brushes for decent sketching studies. Something to do washes with and something to handle concentrated applications of paint. The other factor is size. 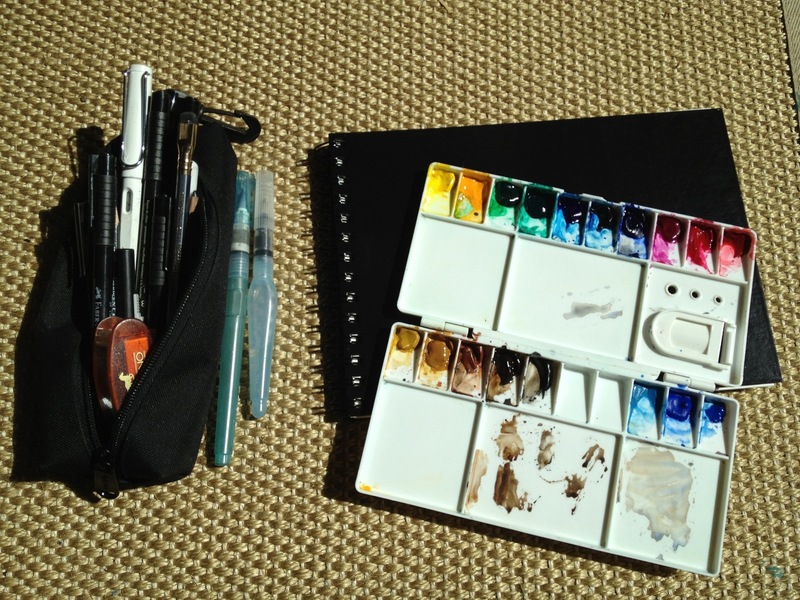 I want the brushes to fit in a small pencil case with my compact kit and a few other items. 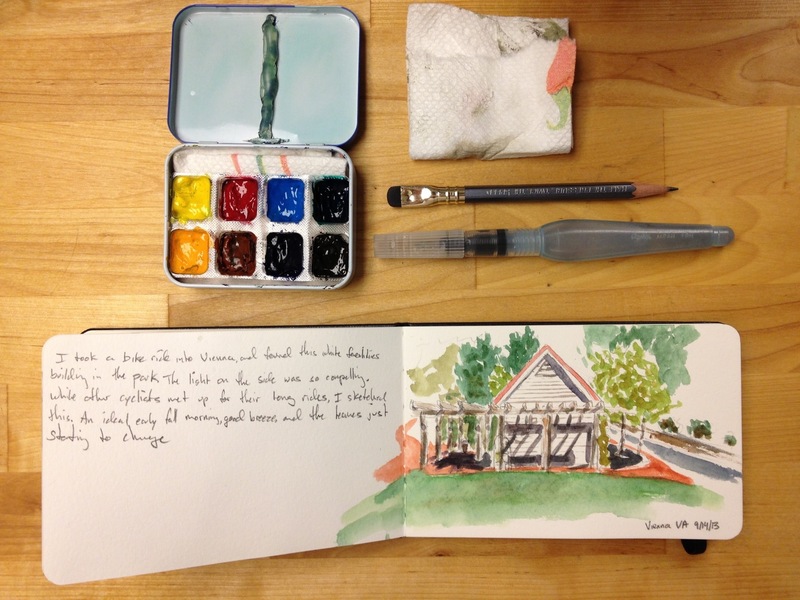 I seem to be settling on my Series 7 #5 (an incredibly versatile brush, with water and color holding capacity of a much larger synthetic), and my Escoda Prado #8 round, which is stiffer and grabs paint well but not much water. Both hold really sharp points, but the Series 7 is noticeably wetter. Good combo so far. A couple cut-off straws to protect the tips, and I should be in good shape. They work well with the Stillmam and Birn Alpha sketchbook, which can take a lot, though scraping can tear into the paper, but it is only a sketchbook, so I don’t expect it to be as good as 100% cotton paper. Despite that colors can look really brilliant.. I also made another change to my compact kit paints. I swapped out Cobalt Blue for Prussian Blue, which is a little more versatile in combo with Ultramarine, and it can go far moodier. 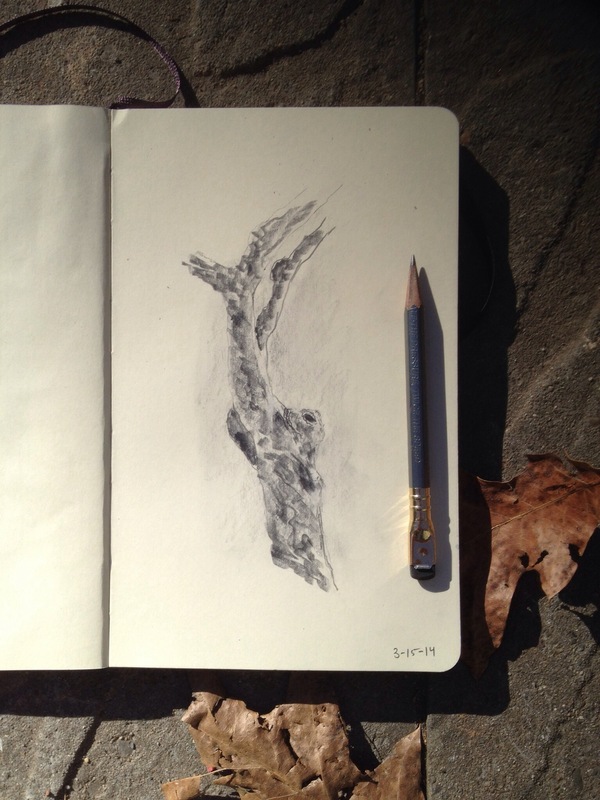 Lastly, while my wife and kids were napping this afternoon (they were so excited for her they woke up really early), I did this pencil study of a tree at my house. This was a good exercise I should do more of.